SALS now offers 4 Houses for Men serious about Recovery! 2 Houses in Milwaukee and 2 Houses in Waukesha. If you are Serious about Recovery, then consider our Houses, your Home!! WE OFFER TRANSITIONAL SOBER LIVING FOR MEN IN RECOVERY. WE CHARGE $120 PER WEEK AND EVERYTHING IS INCLUDED IN THAT PRICE EXCEPT FOOD. EACH HOUSE IS FURNISHED, OFFERS CABLE OR DISH TV, WIRELESS INTERNET ACCESS, FREE HOUSE PHONE WITH FREE LONG DISTANCE, IN HOUSE LAUNDRY, ALL UTILITIES INCLUDED WITH NO LEASES TO SIGN! Services provided at transitional housing facilities varies from substance abuse treatment, to psychological assistance, job training, domestic violence assistance, etc. The assistance provided varies, but it is generally affordable and low cost housing. Read the descriptions of each of the transitional living locations for more detailed information. Transitional housing facilities also may or may not assist with alcohol and/or drug substance abuse treatment.Halfway Housing helps transition individuals and families from shelters or homelessness to permanent housing. Length of stay is usually anywhere from 6	months to 2 years. Residents are often required to pay at least 30% of their income toward program fees. Sometimes the money they pay in fees is	returned to them when they leave. Any emergency or homeless shelter that allows their clients to stay more then 6 months is also classified under this category. Posting Comments below is for viewers on this website only. 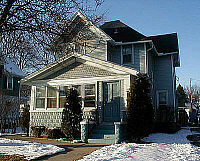 If you have information that can help users regarding SALS Houses Sober Living Homes Milwaukee, please provide it below.